First of all, THANK YOU so much for 400 followers, and to celebrate that, here is a new MOC. 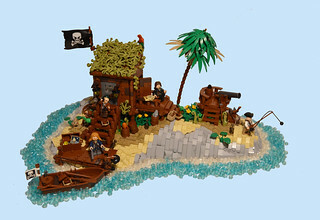 This is officially the first Pirates MOC I've built and posted on social media. It's vaguely inspired by LEGO Pirate sets. The name also comes from Pirates of the Caribbean. The base is almost the same one I used for my previous MOC. I love light bley rockwork, so I decided to keep that and work on it. Used quite a bit of colors in this and that's also one of my favourite parts about it. The water and the water effect isnt so good cos the lightning in my room isn't great. I had to do some editing, but I still wanted to have some water, and dumping studs was the only technique I had enough parts to use. Hope you like this, and thanks again!